My apologies on posting this a day late. My plan is to do a series of posts on getting started for beginners and then all the way up to your first marathon. l had to skip a day but am back and ready for action. Two days ago I posted about starting running and received some great comments and questions about getting started. Several readers told me they were going to get started this week. Yay! I am so excited for all of you whether you are just starting or are continuing to stick with it. Once you have taken the leap into this healthy albeit addictive activity you might start to think about giving a race a try. I actually ran for many years and insisted I had absolutely no interest in doing a race. This was my healthy activity and I just couldn’t fathom why I would want to ruin it by joining a bunch of much speedier runners and pushing myself to the point of throwing up. It just so happened that I was home visiting my parents in Northern Michigan during the National Cherry Festival and there was a 15K going on. I had been running a lot at the time and figured it would be a good challenge and a way to get 9 miles in before I dove into all of the festival food later that day. It was an awesome experience! First of all, I was not the fastest runner but I also discovered that I definitely wasn’t the slowest and it didn’t even matter. Running a race course with a few hundred fellow runners and being cheered on along the way by a few hundred people is so incredible. It is a huge confidence booster. Nothing tells you that you are a runner more than following a course and being cheered on by strangers who are amazed with what you are doing. 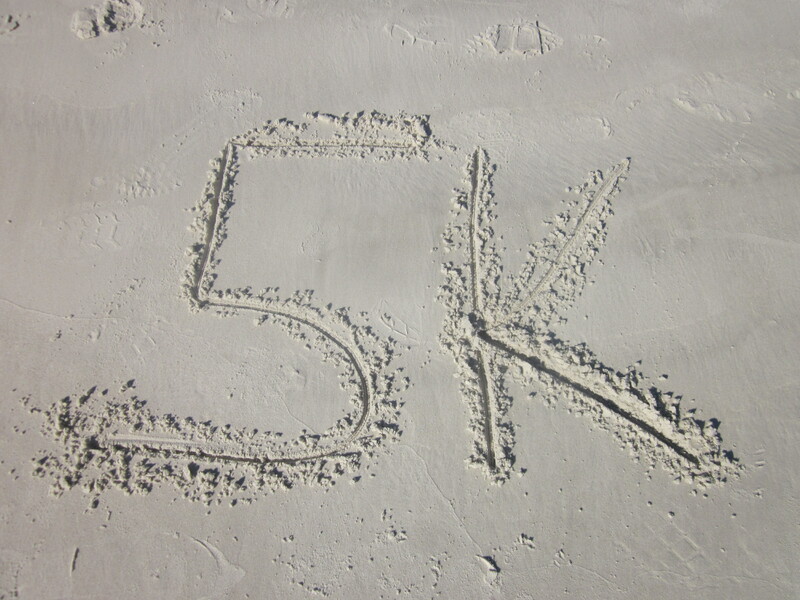 The 5K is a great race because it is a distance that is achievable for just about any runner. In fact you will often find that these races are advertised as both a run/walk meaning you can run it, walk it, or a little bit of both. There are some great aps out there that can help your training for a 5K and I recommend searching around for one that works for your ability and schedule. Another great aspect of the 5K is that while you will want to commit yourself to training and finishing the race, you will not have to make the huge time commitment your need to train for a marathon. In fact, running for 3-4 days per week for about 30 minutes is all you will likely need. Try to find a race that is at least 8 weeks away. My favorite website is runningintheusa.com. They have a great listing of all races throughout the United States. I usually go to my state or a surrounding state and then pick a month that I am looking to find a race. I then scroll through to find something in the area that might work for me. This can be fun because you might find a race somewhere nearby that you never imagined running. It will really mix things up a bit and keep it interesting. 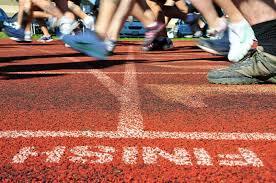 Once you have set a date and registered for the race it is time to make sure you set about on a plan. I am a huge fan of the run/walk method for beginners. I really believe that if you can give yourself those 30 minutes a few times per week to hit the pavement or treadmill you will be prepared to complete a 5K. Someone asked me yesterday how to go about getting started with this plan so I wanted to give a bit more detail. The idea is to head out for a 30 minute work out. If you are a beginner you might want to start with a 2 minute jog followed by a 2 minute walk. You will repeat that 14 times for your workout. If this is hard for you, stick with this same workout a few times and then begin to challenge yourself to longer running bouts. For example you might extend your running to 3 minutes with 2 minutes of walking in between. Over time you can play with the numbers to make your running longer and walking shorter until you are running the entire time. Doing a running workout like this will also make the time on your feet go faster. Focusing on the intervals will distract you from thinking about how much longer you have to go or how hard this might be. If I am stuck on the treadmill I do similar interval workouts just to distract myself and mix it up. It is also a fantastic way to build up your cardiovascular endurance. By the time it is race day you will be prepared to finish your race. Now all you need to do is make sure you get a good night’s sleep the night before. Your race will likely be on a weekend and probably be bright and early. Expect to be waking up earlier than you normally do during the week. Lay out your running outfit and shoes the night before. Make sure it is something you have worn before and feel comfortable with. Race day is not the time to try new shoes or a new outfit. All you will be left with is blisters and unfortunate chafing. Pick out your favorite gear and have it ready to go. If you wear a GPS, headband, fuel belt, iPod, etc. have that all ready to go. Make sure you check the weather the night before so that you can plan your outfit accordingly. I once wore a fleece jacket to a race and pinned my bib across the zipper. I was barely into the race when I realized it was way too warm for the jacket. I had to unpin the entire bib and unzip my jacket and tie it around me, then re-pin the bib to me as I ran. My husband was both amused and impressed, but I don’t recommend this technique. Give yourself plenty of time in the morning to get ready. More specifically, eat and drink with plenty of time for your stomach to digest it. The last thing you want is to get half way through your race and have gastrointestinal issues. I have seen this happen, and it is not pretty! Also keep in mind that you should eat what you normally eat in the morning. If you have cereal each day, eat cereal. The 5K is a short enough distance that you do not need to load up on carbohydrates. That type of eating is used in much longer distances where your body needs to store extra fuel for long periods on the road. Finally, make sure you give yourself plenty of time to get to the race. Head out early so that you are not panicked and rushing to get to the start. Plan for traffic and definitely expect to have to search for a parking spot. Arriving early will ensure that you keep your nerves at bay. If you need to pick up anything the morning of the race you will want to make sure you allot time for that as well. Take some deep breathes, walk around to get your muscles warmed up and smile! Get your feet behind the start line and when that gun goes off have fun. Just don’t let all those runners speeding by cause you to shoot out of the start too fast. Be aware of your pace and keep it around where you usually run. You will soon settle in and it will be a breeze. Have fun and don’t forget to wear your race shirt proudly. Happy running! ← So You Want To Run? This is a great post… It is so much fun having to something to train for. It gives you more motivation to keep going… That is my main motivation to get up every morning to run and work hard (for a race). Thanks I agree. I think having a race in the works helps keep a lot of people going and interested in running. Thank you so much for sharing this. I really appreciate your sharing your finishes at the back of the crowd. So many people say they are afraid to race because they fear coming in last. Someone once said that if you watch a race and watch those runners who come in at the very end you will see that they are just as thrilled and happy to be there and to finish. Congrats on making your return to racing and good luck! Reblogged this on fat man lean man. Interval training on the treadmill is one of my favorite distractions, too, when trying to just keep it going. Informative, and good advice. Thanks a bunch! Thanks. Yes those intervals keep me from going crazy. My husband laughed at me one day because I did that for 11 miles. It would have been awful at the same boring pace. I used the walk run method to get started and it was awesome. I am now training for my first half. There are ton of apps that help with this process and tell you what to do from week to week. So glad you hear you found success this way and that you are training for a half! Congrats and good luck. I will definitely have to check that out. Thanks. This is really good advice for beginner runners. While I still consider myself a beginner, I have done several 5Ks now … and wish I had seen something like this before my first run. Lots of great practical advice! I also like to get to the events early … more because I really love the pre event feel … its just freakin exciting! You are so right, it really is totally exciting! Great post, I think that you covered all of the bases. I wonder how many people run their first 5K every year? 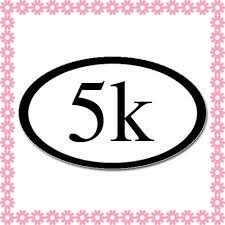 I wonder how many go on to run another 5K? Doesn’t it seem like the number of runners and racers continues to grow? I love seeing it and encouraging it. Thanks for your kind words.